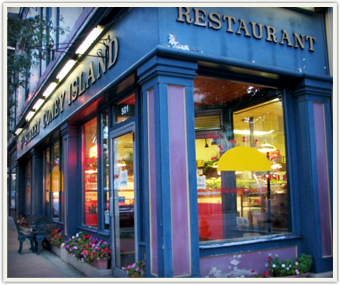 In 1985 Don McClean, owner of McClean Builders, was hired to do some construction work on a restaurant at Mar Jean Village. On completion of the project his customers were unable to pay. In lieu of payment, they offered Don a diner they owned in historic downtown Lafayette. Unfamiliar with the workings of a diner or how to cook on a grill, Don relied on his own enjoyment of good coffee, good food and good service to guide him in his new venture. One of the more difficult tasks was coming up with a name. Many ideas were suggested and rejected until on a chance trip to Indianapolis, Don drove past an old motel named the Sunset Motel. It caught his attention and became the inspiration of the name, The Sunrise Diner. The original location on Main Street had 42 seats, fine for a fledgling restaurant, but as the diner gained popularity it quickly outgrew the space. Fortunately, a nearby historical building (circa 1860), home to the Fifth Street Coney Island restaurant since 1960, became available. On July 18, 1997 the diner moved into the space at 501 Columbia Street. To this day the kitchen serves up the Coney Loin, Coney Dog and Baked Beans made famous by their predecessor.